Here's another of the games that I have in my personal archive and that, for a variety of different reasons, I have not previously uploaded to the blog. For this game, set in the Spring of '44, the Germans are in defensive positions around a small town on the eastern front, with the Soviets attacking them from two directions: the north and the west. The sides began the game under Blinds and spent a bit of time "dazed and confused" as to where their enemy actually was. Soon, however, each side could see the white's of the other's eyes, and battle was joined. In the end, the game was a draw, as although the Soviets had advanced some way towards the town, the Germans still enjoyed good morale and had much fewer casualties. 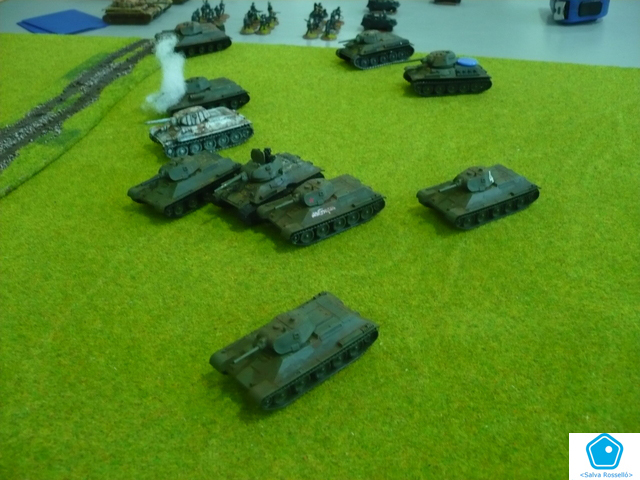 A more aggressive Soviet attack, or even a couple of bad die rolls, could have swung the game either way in an instant.